It's hard to say goodbye to someone or something you love... even when it's a favorite band. But there all comes a time in a musician's career when the guitars must be put down, the sticks put away, and the mics turned off. But occasionally these musicians will consider their adoring fans and supply them with a memorable work of art that they can take home. Thankfully, Grammatrain did just that. Even a year after their break up and after their former lead singer, Pete Stewart put out his first solo album, Grammatrain is still breathing it's last breaths. Although these last breaths are only existening in the form of a final recording, it's an appreciated, well-crafted, praiseworthy effort from this Seattle Christian rock band. And it's none other than... a live album. I have to say, most of the time, I'm disappointed in live albums. Sure some of them capture the raw live sound of the band (Audio Adrenaline, dc Talk, Steve Taylor), but they aren't as listenable as a studio recording. With Grammatrain, live, the listener is treated to live renditions of the band's best and most memorable songs from their two albums with raw one-take restrictions yet resulting in near-studio quality sound. These songs include "Jonah," "Pain," "Execution," "Believe," their cover of Larry Norman's "Six O' Clock News," among other hits. 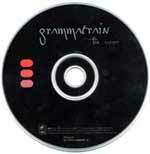 Live in Germany on December 7th, 1998, Grammatrain recorded their final performance during "Rock Fest." Live begins with a female announcer introducing the band in German with Pete's lead of "Less of Me" immediately following. Each song flows neatly into the next, sometimes separated by mini-monologues by Stewart and crowd noise. Unlike some live albums who try soley to capture the feel and energy of a live show, Grammatrain made the wise decision of not mixing in the crowd noise till in between songs only (at most). This effect leaves some of the songs to sound like raw in-studio live recordings. The listener is bound to forget they're listening to a live album until Stewart tries to, without succeeding, communicate with the crowd in what little German he knows. Grammatrain live is essential for any Grammatrain fan, and an appropriate way of saying goodbye to a band who made an impression on the Christian rock music scene even though its existence was anything but lengthy.